Our above-ground recycling containers are intended for selective pre-collection of waste in town centres or at tourist sites for temporary events. Storage capacities available: 1.5 m3, 3.5 m3 and 5 m3. 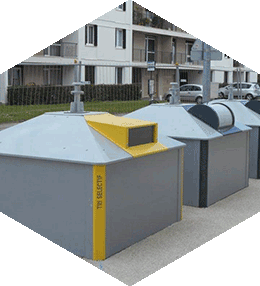 The prefabricated above-ground bins in the BIHR BOX range are designed to blend in with the installation environment. Limited civil engineering, or even none at all, means easy, quick installation on a pavement or terrace or in places with congested underground areas. Choosing a BIHR above-ground container is ensuring low installation costs due to the total lack of excavation and rerouting of underground networks. In addition, the easy-to-move bins can be repositioned wherever you wish in the public space. Above-ground containers can, for example, be used temporarily for events or seasonal activities. All models can be customised: the materials and the external liner colours. One option is to incorporate display areas in the container. The above-ground bin becomes an additional communication medium in the public space. An optional attractive louvre clads the top part of the above-ground container. The BIHR Environnement above-ground bin is now available for urban, suburban and rural areas, motorway rest areas, mountain resorts, public parks, fast food outlet areas, tourist sites, event locations and at the beach.